Outlast 2 was a game that I wanted to play ever since its release on other consoles, around a year ago now. After all, I was a fan of the first Outlast (which has also just happened to release on the Nintendo Switch). With that game, however, the first half was extremely atmospheric, scary and tense, and as such, it was shaping up to be a truly incredible game. But it then went a little downhill from then onwards, so I’d hoped that the second would learn from its predecessor’s mistakes, and by and large, it has. While I don’t think Outlast 2 ever captures the highs I had during the opening sections of Outlast, it is easily the better of the two overall. This isn’t a direct sequel in the sense that we have different characters in a different setting with no real connection to the first game. The only thing that is the same is the gameplay, but more on that later. Here we play as a journalist and cameraman called Blake, who along with his wife, Lynn, are investigating the mysterious murder of a pregnant woman known only as Jane Doe (a name sometimes given to protect ones true identity). Their helicopter crashes and when Blake wakes up, his wife is missing and he finds the pilot of the helicopter skinned and therefore consequently, dead of course. You come to realise that you have, unfortunately, and rather predictably, crash landed in a rather dodgy town and everybody you come across wants to chase after you and kill you. The early story and wooded setting used here reminded me of the early sections of Resident Evil 4 and 7 which is by no means a bad thing. Just like in those games, the game does its best in having an open space in which to explore, but if you don’t want to do that, it also makes it clear that there is a fairly linear path to take in order to progress. 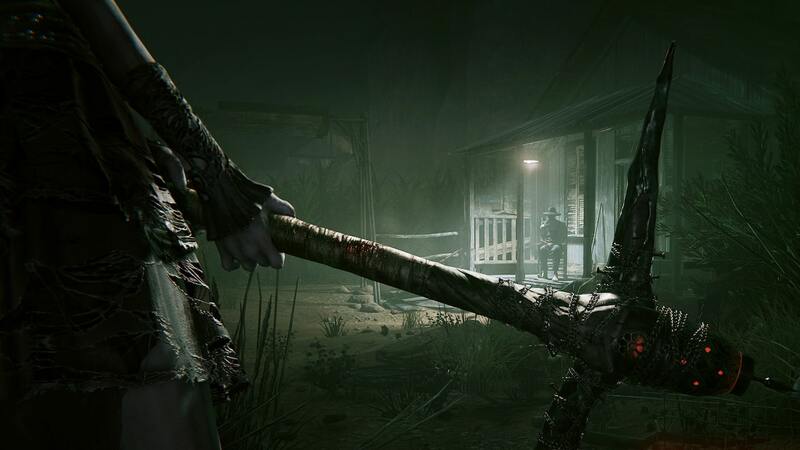 As mentioned above, the gameplay is very similar to Outlast, so if you have played that game then you will have a good idea of what to expect here. In what was one of the best inclusions in any horror game of recent memory (for me at least), the video camera gimmick, returns. It’s pretty self-explanatory in that you play the game viewed through a video camera. This means that in the areas that are particularly dark (of which there are many, this is a horror game after all), you are able to use the night vision mode of your camera in order to see. With it being night vision, the display becomes grey-ish and grainy, you will either see this as a novelty that will quickly wear off or it will only increase the tension and atmosphere. Your camera has a limited amount of battery life too, so you can’t just keep the night vision on constantly. In order to replenish it, you pick up batteries throughout your adventure. I never personally ran out of batteries to use as I was constantly turning off the night vision mode and turning the camera off altogether when I knew that I did not require it. Because of this, I’m not sure how easy it is to completely run out of batteries. With it being a camera you are also able to zoom in order to see in the distance and you can also record certain things of interest in the world, such as important buildings and the aforementioned dead pilot. Recordings happen automatically, providing you have your camera out at the time and are looking the subject at hand. This uncovers a little more of the backstory for you and as such means, it is completed optional, but for people like me who likes to get everything out of a game’s story, it’s a very welcome addition and only increased my enjoyment. There is no combat system in place here as you never wield a weapon, so your only option is to hide from enemies in the hope that they don’t find you. I know that this will be a bit divisive for some players as not everybody likes that style of game, but just like in the first Outlast, it is done well. There is a great sense of panic and danger whenever an enemy is alerted to your presence and you then have to quickly find somewhere to hide. Take it from me, there is nothing worse than trying to find a good hiding spot, only to turn around and find that you have an enemy right on your tail. Having said that, as you get further into the game, the whole hiding mechanic can start to feel like it’s getting a tad repetitive. Maybe having a couple of one use only weapons could have prevented this somewhat, it isn’t a major issue as the game still throws in some scares in the latter sections of the game, but it is something to keep in mind. I have to say when the Outlast games were announced for the Nintendo Switch I was slightly worried that a fairly big graphical downgrade would be made to accommodate Nintendo’s handheld, but my worries were for nothing as it is one of the best ‘realistic’ looking games on the system. Of course there had to be some sacrifices, one being that the Switch version is locked at 30fps, but for the most part, it looks pretty much on par with the other consoles, much to my surprise. It also runs pretty great too as I only encountered a couple of framerate drops throughout my entire time playing the game. While playing in handheld mode, I noticed that there is more pop-in from things like trees in the distance, but again, it’s nothing major and certainly not enough to make me want to immediately switch (pardon the pun) back to TV mode. Outlast 2 is a fantastic technical achievement on the Nintendo Switch with a good story and a setting that is impressively and increasingly atmospheric. It isn’t for everybody though, as some of the stealth mechanics used will grow increasingly tiresome for some. As such it isn’t perfect but it improves upon a lot of things that Outlast did wrong and is a better game overall than that title. If you’re a horror fan then it’s a must play, it is as simple as that. It is one of, if not the best horror game currently available on the Switch. Get your headphones at the ready.